Get Your Fiddle On at Black Bart Playhouse This Weekend! Have you ever picked up a violin, fancied yourself a fiddler, daydreamed of a good fiddle throw-down or just yearned for the chance to take in some eloquent and passionate string playing? 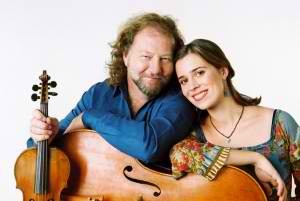 Well then, there’s something pretty groovy going on over at the Black Bart Playhouse this weekend and it’s kicking off with some enchanting Scottish fiddle and cello music by Alasdair Fraser and Natalie Haas this Friday night. As if a beautiful concert wasn’t enough, Alasdair is offering a fiddle workshop the following morning!